In what was the high profile match-up in Miami County, James Anderson (above) and the Troy Christian Eagles outlasted Bethel 66-60 in overtime in “The Hive”. 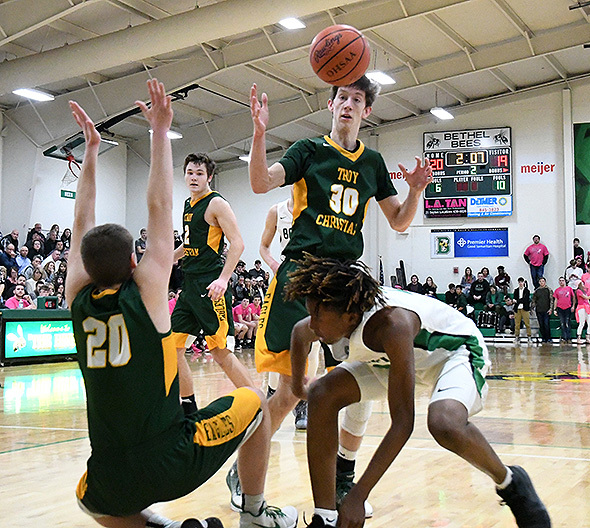 Arguable the two best basketball teams in Miami County put on a show as Troy Christian outlasted Bethel 66-60 in overtime in a prelude to what may transpire in the state tournament. BRANDT – You can never assume anything in high school basketball, especially at tournament time. But believe this – if the Bethel Bees and Troy Christian Eagles meet in two weeks for a sectional championship at Northmont High School, cancel whatever plans you may have made. Go buy a ticket and go to the game. No guarantees, but I bet you won’t be disappointed. 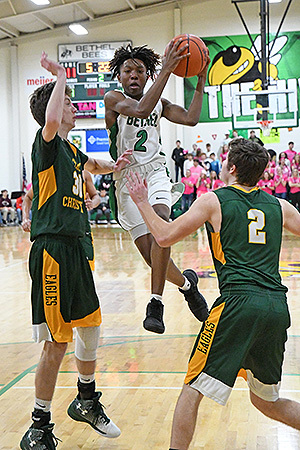 The Eagles and Bees played an epic season finale Saturday night before a large crowd at “The Hive”, and the visitors shook off a buzzer beating three in regulation to run their winning streak to 16 games with a 66-60 overtime win. The Bees, playing without injured star Caleb South, who injured his left knee during Friday’s romp over Newton, got off to a horrendous start. Bethel missed 10 of 11 shots in the quarter and trailed 16-4 after 8 minutes. Bethel’s Kendall James made some plays in spectacular fashion to keep Bethel in contention to the end. Things changed completely in the second quarter, as the Eagles missed 8 of their 10 shots from the floor, and Bethel went on a 21-7 run. Kendall James scored 7 points in the quarter and Ryan Rose added 5 as the Bees took a 25-23 lead into the break. Bethel missed 6 three-point attempts in the third quarter as Troy Christian regained control. James Anderson, the Eagles 6-9 senior center, asserted himself inside and the Eagles took a 38-31 advantage into the final 8 minutes. Troy Christian maintained the lead down the stretch, but the Bees would not go away. The Bees got two offensive rebounds off missed threes before Jacob Evans scored to make it 48-47 Eagles with 44 seconds left. James then missed a drive that would have given Bethel the lead. Ben Schenk buried two free throws to make it a three-point game again, but James made two for the Bees and it was 50-49 with 19 seconds left. Schenk was fouled immediately, and the 6-foot senior calmly made two more from the stripe, and Troy Christian led 52-49. The Bees played for the final shot, and Korry Hamlin found himself alone in the left corner. His trey ripped the net with 1.3 seconds to play, setting off an eruption from the Bethel fans. The Eagles, however, did not panic. Jackson Kremer scored out of the paint to give Troy Christian the overtime lead, and Cameron Strine followed with a three-point play to make the lead 57-52. That turned out be enough as the Eagles made 10 of 15 from the line in the extra session to keep the Bees at bay. The Eagles, champions of the Metro Buckeye Conference, won their 16th straight game despite allowing a season-high 60 points. Anderson scored 14 of his team-high 20 points after halftime, while Schenk had 11 of his 17 in the second half. Strine also finished in double figures with 11. 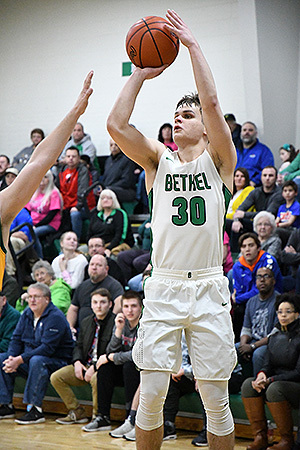 Bethel’s Ryan Rose hit some big shots in the second quarter to give Bethel a halftime lead. 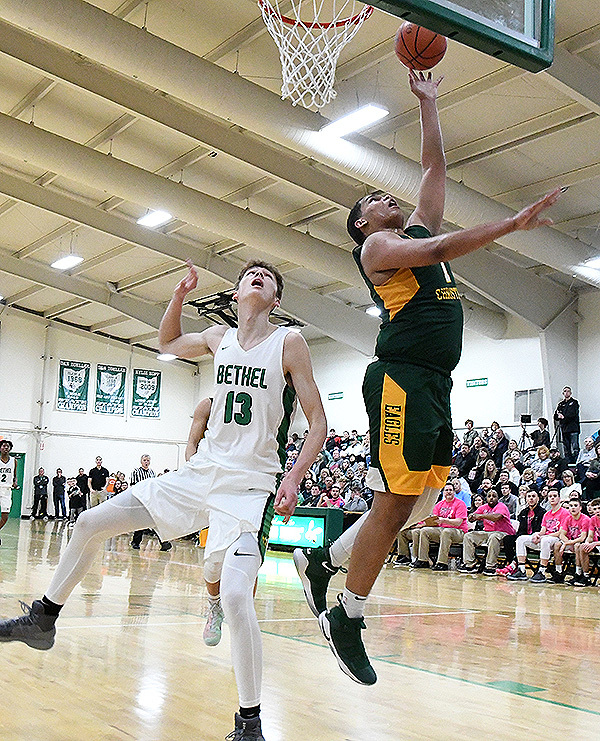 Bethel, which celebrated back to back Cross County Conference titles Friday Night, got a terrific performance from Kendall James. The 5-8 junior stepped up in South’s absence, scoring a game high 25 points, including two in the fourth quarter and overtime. Ryan Rose was the only other Bee in double figures, finishing with 12. Troy Christian shot 45% from the floor, 22% from the arc, and 67% from the line, making 20 of 30. Bethel was just 33% from the field, 40% from the arc, and 57% from the line. The Bees went to the line 21 times, but made just 12. Troy Christian out-rebounded the Bees 33-31, and had 11 turnovers to Bethel’s 9. Asked about a possible tournament re-match with the Eagles, Kopp said his team had a lot of work to do first. Zawadzki said his team is taking nothing for granted entering the post-season. After Saturday’s overtime win over Bethel, who can blame Zawadzki for being excited? In a close game between two evenly matched teams, sometimes the way the ball bounces can determine the outcome as evident by the reaction of Troy Christian’s Jackson Kremer #30 and Conner Case #20 as they battled Bethel’s Kendall James for a loose ball.